The human body is designed to function the most effectively with REAL food (food that is nutritionally bioavailable). 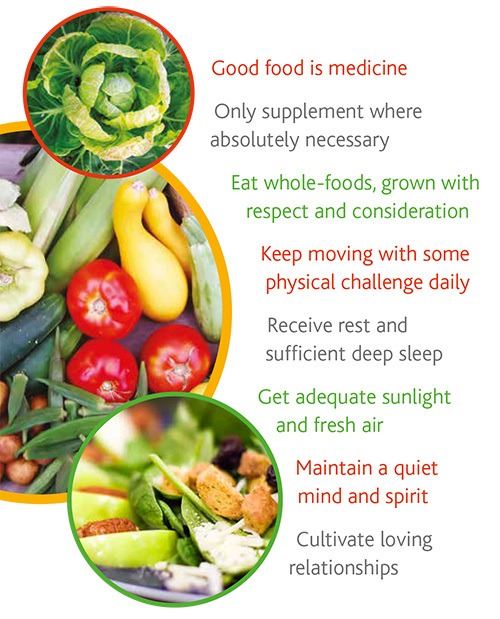 Natural nutrition is still the best source of energy, healing and good health. Did you know that eating the right diet, combined with lifestyle changes will have a greater impact on your health than taking supplements or using chronic medication? Follow the proven Better4life Programme to improve your health and wellbeing. Each session is tailored to your own specific health needs. One-Week Food Diary: Before our first consultation, each client completes a 1-week food diary. This gives an accurate picture of routines and eating patterns. Initial 1-Hour Consultation: During the first 1-hour consultation, we discuss your medical and family history, illnesses, and medication you are taking, lifestyle and eating habits. We set realistic health goals for ways to lower stress levels, increase energy and improve your overall health. Personalised Eating and Wellness Plans: Based on proven nutritional principles, a personal eating plan is developed for you. Exercise, wellness and natural medicine recommendations are also given. We also discuss the first step which is a gentle cleanse to assist the body to remove any problematic toxins. The Better4Life cleanse results in higher energy levels, reduced water retention, glowing skin and healthier liver function. Weekly Updates: There is constant support for you where the greatest change is needed. One-Month Follow-Up Consultation: At the end of the first month, we track our progress and talk about any adjustments to your Better4Life Programme. Your personal wellness plan is also reviewed and optimised. 3-Month Progress Checks: Follow-up consultations are given every 3 months to monitor your progress and to give any assistance you may need. This is a vital part of wellness transformation: having a personal health coach to walk alongside you and encourage you each step of the way! In July 2017 Charlotte came into my life (and my liver and my stomach) and touched it and changed. I cannot thank you enough. I believe that you have slowly but surely given me portions of my health back. I am convinced that the recommendations you have given me for cleansing my liver are helping me live a better life every day. I have more energy, I feel as though my digestive system works even better than before and I am better able to handle stress. Even my sinus problem is almost under control. I am excited with this health journey I have begun. This is my thank you. I am singing your praises to one and all. I think I must be driving everyone mad, but I am so impressed with the products, both Africa Grace and Better4Life. I do not know when last I have felt this great. I sleep like a baby, I am almost too relaxed at work and my overall energy levels have improved unbelievably. I just wish I found you guys 10 years ago!